Just like the old days before the diesels arrived. 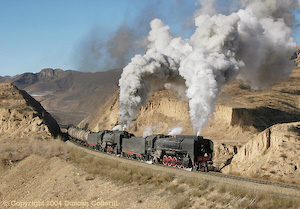 QJ 7009 and QJ 6998 passed "The Quarry" on 27 November 2004. This was one of four steam hauled freights over the pass that day, enough to keep us happily occupied. There were only three steam workings over the pass in daylight on 30 November and they were all at Jingpeng at the same time. QJ 6998 is pictured leaving with a train of westbound coal empties in the early afternoon. 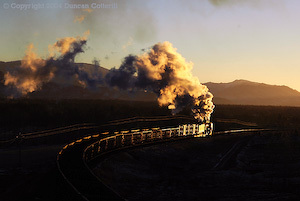 This train emerging from Tunnel 4 behind QJ 7007 and QJ 7009 on 30 November 2004 was our last afternoon eastbound over the pass. 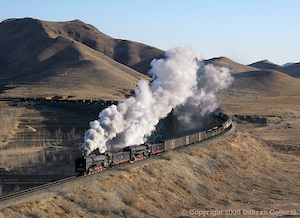 This train and the one that followed were the only all steam eastbounds over the pass during our last four days at Jingpeng. QJ 6998 & QJ 7143 did the honours. 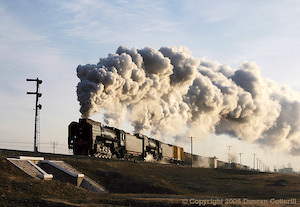 Diesel + steam combinations were common during the first few days of December. 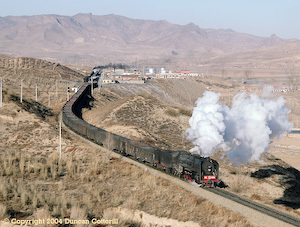 DF4 6005 & QJ 6878 were photographed above Liudigou. 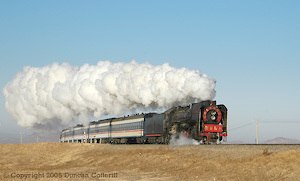 QJ 7030 caught the last rays of the sun near Yuzhoudi on 27 November 2004. What a fabulous experience photographing steam at Jingpeng was. We will never see its like again. 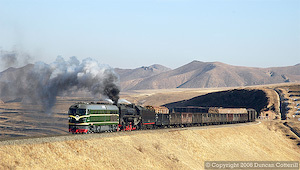 East of Daban, steam working was still the norm and most trains were double headed. QJ 7104 led ex works QJ 7063 on the climb from Yamenmiao to Lindong with a long westbound freight on 7 December 2004. Decorated QJ 6911 was the regular power for the stopping passenger trains between Daban and Chabuga. 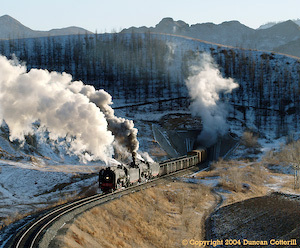 What a glorious sight it was, romping up the climb from Yamenmiao on 7 December 2004. QJ 6984 and 6891 got underway from Yamenmiao with a long westbound freight. Judging by their vigorous departure, this pair wouldn't have any difficulty getting up the hill to the summit beyond Chaganhada. 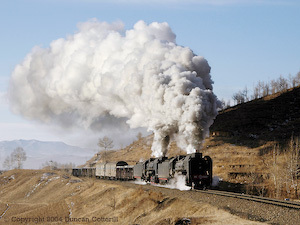 When we left Jingpeng on 4 December it looked like steam over the pass would quickly come to an end but a few QJ workings continued until late March 2005. Daban - Chabuga remained predominantly QJ worked for a few months more - see September 2005 report. After 175 years, the era of Main Line Steam was drawing rapidly to a close. As has been reported elsewhere, the Ji-Tong Railway is in the process of dieselising operations between Daban and Haoluku. This leaves Daban to Chabuga as the only predominantly steam section and the world’s last steam worked main line. Jim Livesey, Mike Watts and myself visited both the Haoluku and Chabuga sections in late November and early December. The trip was planned before it became apparent that steam would disappear so quickly from Daban to Haoluku but we decided to go ahead regardless as there was nowhere better to visit. In total we spent 16 days on the line, eight based at Reshui and eight at Lindong. After arriving at Beijing, we met our guide Sun Xiaolan then paid a visit to the museum and the model shop in Baofusi St (see my September report). Train 2559 took us overnight from Beijing Bei to Chifeng from where we continued by road to Reshui. As it was dark almost all the way, no observations of interest were made. For the first few days, things were quite good with three to five all steam hauled trains over the pass in daylight each day. The remainder were either diesel+steam combinations or all diesel workings. The exact pattern varied from day to day but there were enough steam workings to keep us busy. By the time we left, the number of QJ hauled trains had dropped to one to three per day. The change happened around 30 November. After that date, there appeared to be a deliberate attempt to maximise the use of the diesels. This was achieved by running as many trains as possible with a single DF4. Westbound traffic has always included a significant proportion of empty wagons so assembling trains of 30 to 40 wagons capable of being hauled by a single diesel was not generally too difficult. Eastbound trains were heavier but most of the route from Haoluku to Daban is downhill so 40 wagon trains only required double heading over the 24 km from Jingpeng to Shangdian. By detaching locos at Shangdian and sending them back to assist the following train, every train could be double headed up the hill but only required a single loco for the majority of its journey. There weren’t enough diesels to cover every train so heavier westbounds could be hauled by DF4+QJ combinations or double QJs. Some eastbounds arrived at Jingpeng behind single QJs, only to pick up a DF4 pilot to Shangdian. In these cases, the QJ would continue with the train downhill to Daban while the DF4 would return to Jingpeng to pilot the next train. There were a few all steam workings from Haoluku to Daban but they were the exception rather than the rule. On 2 December there wasn’t a single eastbound train over the pass in daylight that didn’t have a DF4 at the front and the first westbound steam working didn’t pass Sandi until 14:50. That was a bad day, but the rest weren’t really much better. I don’t want to give the impression that our visit was a disaster because it certainly wasn’t. In eight days we got around 30 really good pictures, some of which we might not have tried if everything was steam. It was hard work though and there were long periods when there was nothing worthwhile to photograph. The task was made easier by the availability of information on which trains would be steam. This sometimes changed during the day but was generally accurate. We may have experienced a bad patch and the level of steam workings could recover but future visitors will require a lot of luck. Photography was made more difficult by the new pole line which runs on the south side of the railway west of Jingpeng and east of Galadesitai. There are a handful of spots where it is far enough from the track to avoid being a problem but they are few and far between. On the pass itself, the poles generally take a direct route between stations and don’t usually get in the way. QJ 6763, 6773, 6828, 6878, 6981, 6986, 6988, 6996, 6998, 7007, 7009, 7010, 7030, 7038, 7137, 7143, 7164. DF4 0392, 0490, 0537, 0539, 0548, 0552, 0570, 0660, 6005, 6007, 6011. The Daban – Chabuga section was busy, with trains leaving each end at approximately 60 – 90 minute intervals for much of the day. Many trains were double headed but there were a significant number of single headers as well. Three diesels were seen on trains but they appeared to be en route to/from Tongliao for maintenance. Everything else was QJ hauled. The new pole line has ruined a number of locations on this section but it is often far enough from the track not to be a problem. The new road is largely complete between Chabuga, Daban and Jingpeng and gives access to the line between Lindong and Chaganhada. The old road is still in very poor condition on the section close to Xiaoxinglongdi and east of Yamenmiao although the earthquake damaged bridges between Yamenmiao and Diaojiaduan have now been rebuilt. The state of the road and the general speed up as a result of double heading make chasing more difficult than before but fortunately traffic is heavy enough to require trains to be looped regularly. Lindong itself is now a significant freight hub with new chemical traffic into the zinc smelter (not a lead smelter as previously reported) and coal being transhipped from road vehicles to rail wagons. General goods traffic also appears to be buoyant and more trains shunt at Lindong than before. Diaojiaduan has gained an extra loop since September making 3 tracks in total. The semaphore signals have also been replaced by colour lights. A surprising number of locos were seen both sides of Daban. The practice of locos working on one side or the other appears to be a thing of the past. QJ 6911 was the regular passenger loco. QJ 6639, 6751, 6825, 6849, 6882, 6891, 6911, 6925, 6977, 6978, 6981, 6984, 6988, 6991, 6998, 7007, 7012, 7037, 7040, 7048, 7049, 7063, 7081, 7104, 7119, 7143, 7163. In Transit: QJ 6853 ex works, QJ 7105 to works. Returning to Chifeng via Daban, we were lucky to catch a pair of QJs departing towards Haoluku past the depot. An appropriate way to end what will almost certainly be my last visit to the Daban – Haoluku section (for steam at least). Train 2559 took us from Chifeng to Beijing Bei overnight, leaving plenty of time to travel to the airport for our return flight. I suppose it had to happen eventually. Main line steam couldn’t last forever but the realisation that the end is fast approaching still comes as a bit of a shock. Rather than grieve over the imminent loss of Jingpeng Pass, we should celebrate the fact that it actually existed at all. In the mid 1990s, steam was in rapid decline on the CNR system and the last main line operations seemed to be destined for the uninteresting flatlands around places like Da’an. Then a miracle happened . . . Julien Blanc found Jingpeng Pass. It was like a dream come true, a brand new, steam worked, main line railway running through outstanding scenery and built on a grand scale with viaducts, tunnels, high embankments, deep cuttings and horseshoe curves. Photographically, the potential was almost infinite and, in 13 trips over 8 years, I haven’t come close to exhausting the possibilities. Suddenly, Da’an had become irrelevant. Thank you Jingpeng Pass, it’s been a great eight years.